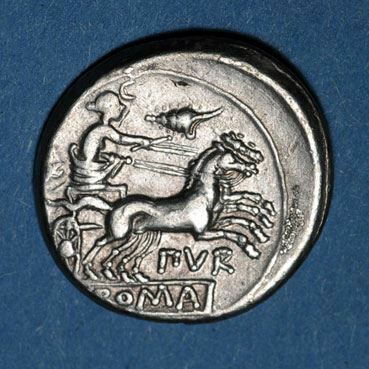 Furius Purpurio was a moneyer between 169 BC and 158 BC. He is evidently not the same as the L. Furius Purpurio who was consul in 196 BC. His denarii feature a murex shell, a punning allusion to the moneyer’s name. The shells, found mainly around the southern Mediterranean coastline, were left to decompose and the purple ink which resulted was used to make purple dye. This dye was highly valued throughout the ancient world, and used in Rome to colour the senatorial togas. Gens Furia was one of the most ancient and noble patrician houses at Rome. Its members held the highest offices of the state throughout the period of the Roman Republic.